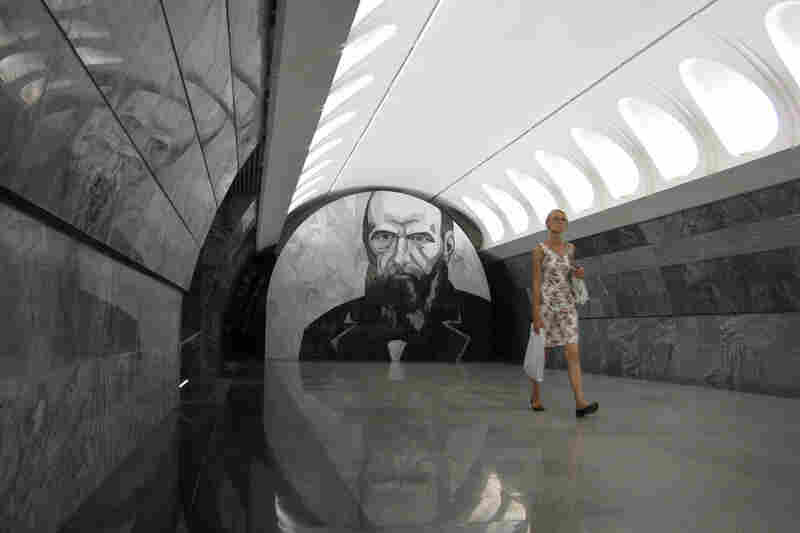 A Dark View Of Dostoevsky On The Moscow Subway The Dostoevskaya station, meant to honor the author of Crime and Punishment, has some Russian psychologists concerned that murals of violent scenes will play with riders' minds. The Dostoevskaya metro station opened in Moscow in June 2010. Subway riders entering the new station can't miss the oversized portrait of Russian writer Fyodor Dostoevsky staring down at them. 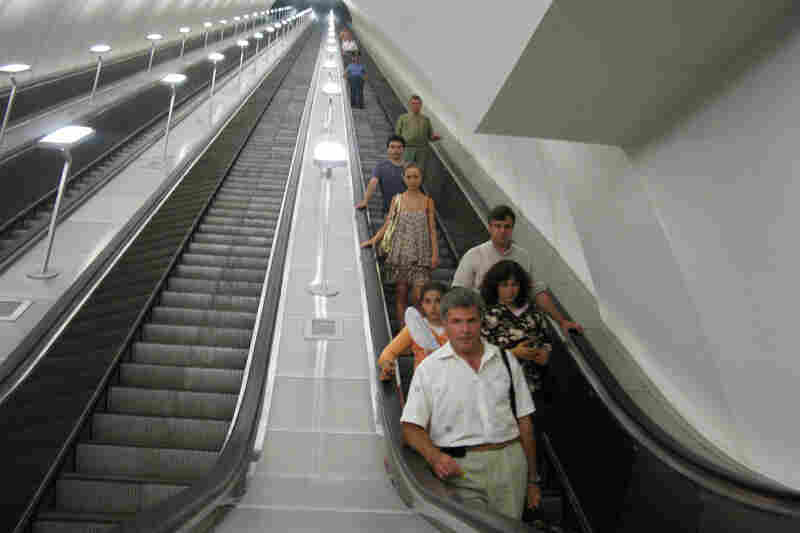 Riders descend a long escalator into the Dostoevskaya station, where the walls are mostly gray. 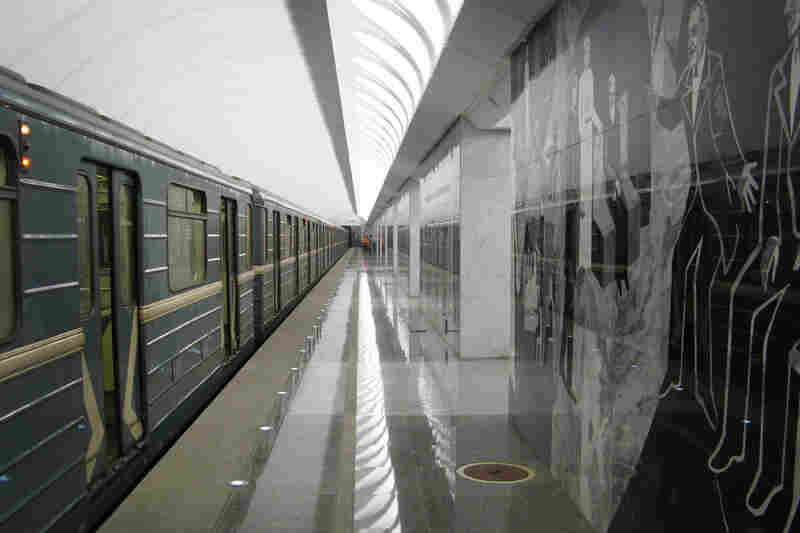 The station has been in the works in Moscow for nearly 20 years, delayed by funding problems and perhaps concern over how it would be received. Subway riders not in a rush often pause for a look or a snapshot of the station's gloomy artwork. Waiting for a train at Dostoevskaya means time to gaze at murals depicting scenes from Dostoevsky's book The Idiot – or to pose for a friend to take a picture. The murals capturing scenes from Dostoevsky's book The Brothers Karamazov are front and center. Psychologists have expressed concern that the mood is too gloomy — and could even encourage suicide. At times, riding the subway in Moscow can feel like roaming an art museum. The underground hallways and platforms are full of mosaics, statues and ornate chandeliers that celebrate war heroes, depict Soviet life and commemorate writers -- but opening such stations isn't always an easy process. 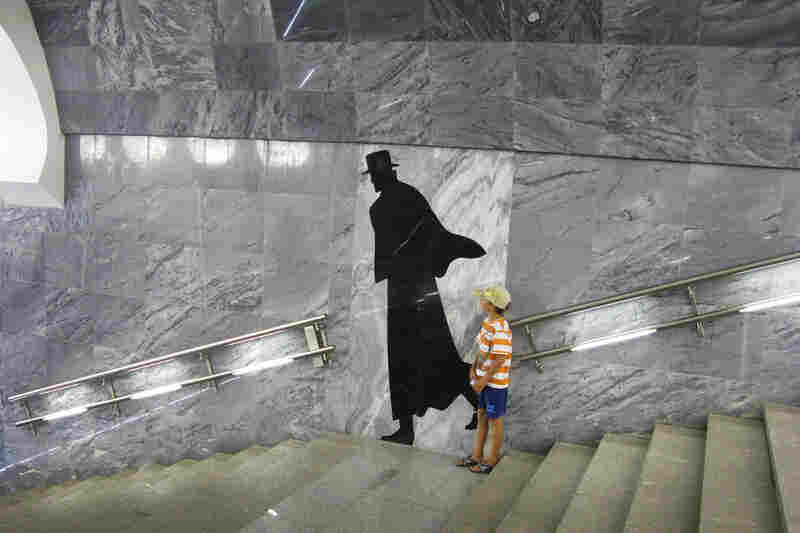 The Dostoevskaya station -- which opened this summer in memory of Russian writer Fyodor Dostoevsky -- met a fair share of opposition when psychologists expressed concern that dark murals of the violent scenes from Dostoevsky's books could put riders in gloomy moods -- or, worse, even encourage suicidal impulses. Such criticism has clouded and delayed a 19-year effort to honor one of Russia's greatest writers and thinkers. Ivan Nikolayev, the artist who was commissioned to create the murals that surround the subway platform, started rereading Dostoevsky's books and making sketches for the project 20 years ago. "My task was to draw out the meaning, creativity and entire life of Dostoevsky," says Nikolayev, 69. Nikolayev's design takes you right into Dostoevsky's world as soon as you step off a train. The walls are gray and bare, except for murals capturing scenes from Dostoevsky's famous novels: Brothers Karamazov, The Idiot, and of course, Crime and Punishment, the book where Dostoevsky digs into the mind of his lead character, Raskolnikov, exploring a young man's path to murder. In one famous passage, Raskolnikov cries out, "Good God! Can it be, can it be, that I shall really take an ax, that I shall strike her on the head, split her skull open ... that I shall tread in the sticky warm blood, break the lock, steal and tremble; hide, all spattered in the blood ... with the ax ... Good God, can it be?" The fictional character -- poor, desperate for money to help his family and mentally tortured -- ends up killing two women. And it's all depicted in a mural right on the subway platform in which Raskolnikov holds an ax over a woman's head, while a corpse lies on the ground. Mikhail Vinogradov, who heads a psychological help center in Moscow, went on Russian TV to complain that the murals will make people "afraid to ride the subway." Like other psychologists who raised concerns in Russia and abroad, Vinogradov says gripping images can induce violent behavior -- and a subway station is the last place for that. "There will be suicides more often," he says. "I can't rule out people will commit murders or attacks." But Natalia Semyonova, another clinical psychologist in Moscow, defended the artist and the author, whose books she uses in lectures and to treat patients. "We try to jump into these books and try to understand once more the motives of human behavior, the motives of human suffering, how to overcome, how to find a sense of life, and so on," Semyonova says. Using powerful literature to help overcome challenges in one's own life, she says, is very Russian. As for the murals, perhaps international visitors will be startled, Semyonova says, "But, for Russians, Dostoevsky is so familiar to them. They know everything in these books." Commuters traveling through Dostoevskaya say it's about time the city built the station. They say forget Russian literature, this is about cutting down the commute. Rider Alexander Alexandrov, 63, says the bottom line is that "this is a good, new station" built to honor a Russian literary icon. He says he was angry that psychologists raised such a stink. "They walk in here and try to find negative things," Alexandrov says. "Well, there are too many negative things in our lives." But Natalia Yuryevna, a Moscow retiree, is not altogether pleased with the station. She likes that the gray decor and macabre murals are "in line" with Dostoevsky's writing. But the lighting, she says, make her "lose her orientation." 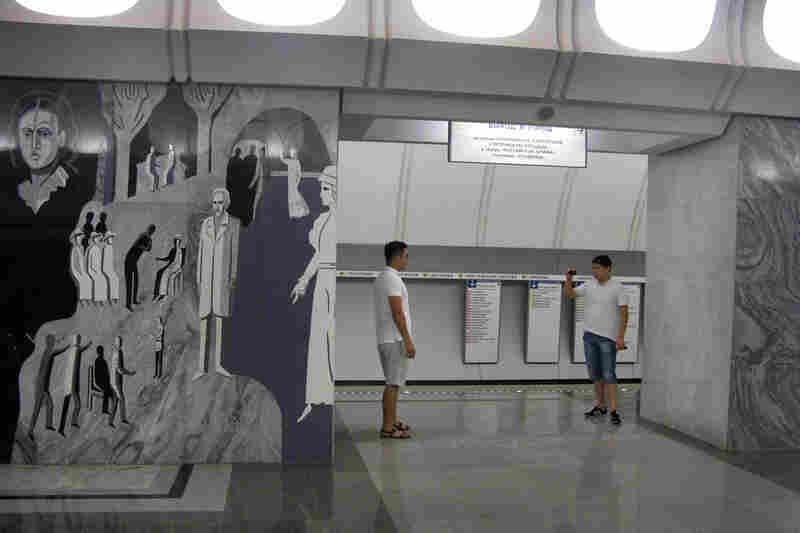 Since the station opened its doors, Nikolayev, the artist of the murals, has been asked repeatedly whether the mural of Raskolnikov from Crime and Punishment, in particular, was over the top. His answer comes in the form of another question: "If someone handed you Dostoevsky's own manuscript, would you just go cross out this scene from the novel?" Besides, most of the murals aren't actually that violent. Many are simply sullen -- like the gray, bearded face that greets commuters in one of the station's tunnels. It's a portrait of Fyodor Dostoevsky -- the newest addition to the club of Russian writers memorialized in Moscow's underground -- and he's looking melancholic as ever.